Our lab studies the contribution of inflammatory mediators in neovascular age-related macular degeneration (AMD). AMD is a degenerative condition of the macula (the central retina) and is the most common cause of vision loss in individuals 50 or older. Neovascular or “wet” AMD occurs when new blood vessels invade the macula leading to photoreceptor death. Inflammatory mediators, such as prostaglandins, are thought to be involved in this process. Our lab has already shown that inhibition of cyclooxygenase (COX) and thereby prostaglandins with nonsteroidal anti-inflammatory drugs (NSAIDs) can inhibit neovascularization in an animal model of AMD. Further downstream inhibition of specific prostaglandin subtypes or their receptors should enable more targeted therapeutic strategies. The laboratory uses cellular and molecular approaches to investigate the role of inflammatory mediators in neovascularization and relies on animal models of AMD to measure therapeutic effects. Inflammatory pathway: NSAIDs are more specific than corticosteroids in inhibiting prostaglandins through their inhibitory effect on cyclooxygenase. Inhibitory effect of ketorolac on choroidal neovascularization. We have previously established that NSAIDs are safe when injected into the eye and significantly inhibit ocular inflammation in an animal model of uveitis. We are currently utilizing an animal model of AMD to study the efficacy of intravitreal injection of NSAIDs (ketorolac) on choroidal neovascularization (CNV) development and progression. 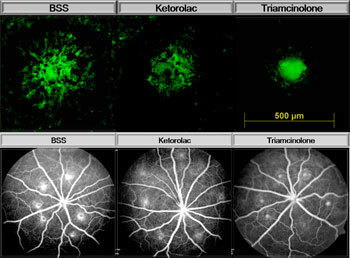 Choroidal tissue mounts and fluorescein angiograms demonstrating inhibition of CNV with ketorolac in a rat model of AMD with respect to saline (BSS). Ketorolac’s inhibitory effect was less than that of corticosteroid (triamcinolone). The exact relationship of COX and prostaglandins with VEGF and other inflammatory mediators in CNV remains poorly understood. Consequently, we are studying the relationship of COX, prostaglandins, and VEGF in both the vitreous and retina using animal models of AMD to better define cause and effect relationships. Kim SJ, Toma HS. Inhibition of choroidal neovascularization by intravitreal ketorolac. 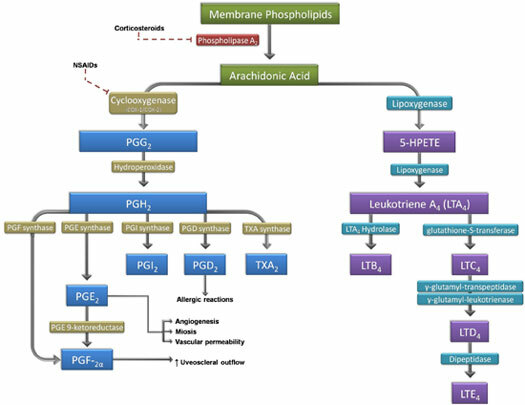 Arch Ophthalmol (in press). Lo WR, Kim SJ, Aaberg TM Sr, Bergstrom C, Srivastava SK, Yan J, Martin DF, Hubbard GB 3rd. Visual outcomes and incidence of recurrent vitreous hemorrhage after vitrectomy in diabetic eyes pretreated with bevacizumab (avastin). Retina. 2009;29(7):926-31. Durairaj C, Kim SJ, Edelhauser HF, Shah JC, Kompella UB. Influence of dosage form on the intravitreal pharmacokinetics of diclofenac. Invest Ophthalmol Vis Sci. 2009;Jun 10. [Epub ahead of print]. Kim SJ, Martin DF, Hubbard GB, Srivastava SK, Yan J, Bergstrom CS, Aaberg TM. Incidence of post-vitrectomy macular edema using optical coherence tomography. Ophthalmology. 2009 Jun 4. [Epub ahead of print]. Kim SJ. Diabetic macular edema. Ophthalmology. 2009;116(6):1228. Belair ML, Kim SJ, Thorne JE, Dunn JP, Kedhar SR., Brown DM, Jabs DA. Incidence of cystoid macular edema after cataract surgery in patients with and without uveitis using optical coherence tomography. Am J Ophthalmol. 2009;148(1):128-35. Kim SJ, Bressler NM. Optical coherence tomography and cataract surgery. Curr Opin Ophthalmol. 2009;20(1):46-51.